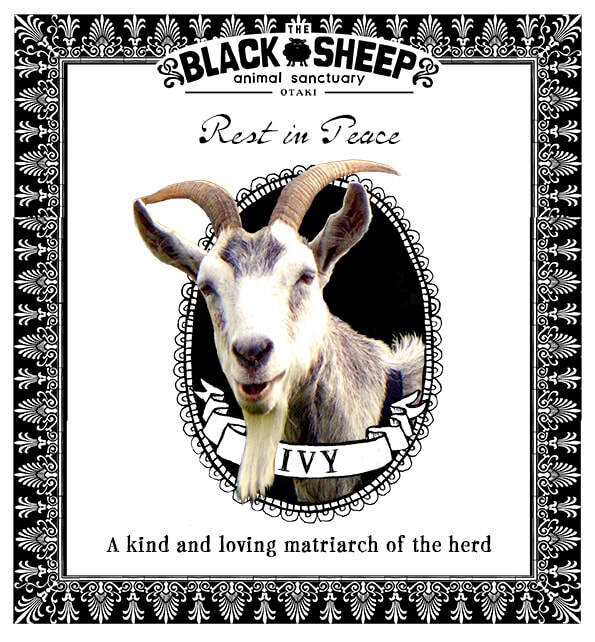 If an animal dies at the Black Sheep, we dig a deep hole at the far edge of the goat paddock, and plant a tree for fruit or shelter over the grave. He or she lies only a few metres from the calls of the ducks, the gutteral conversations of sheep and goats. The cadence of sanctuary life, of feeds and cuddles, continues around them. At night there's the thick country darkness, like blotting paper. Grass grows long between the saplings, and the goats push their heads through the wire fence to grab sly mouthfuls. When the end comes, we miss the loving, mysterious, sometimes cantankerous creatures who lived with us. Death is inevitable for all of us. Though the pawprints and hoofmarks our friends once left on the earth are long since trodden over, they remain imprinted on our hearts. 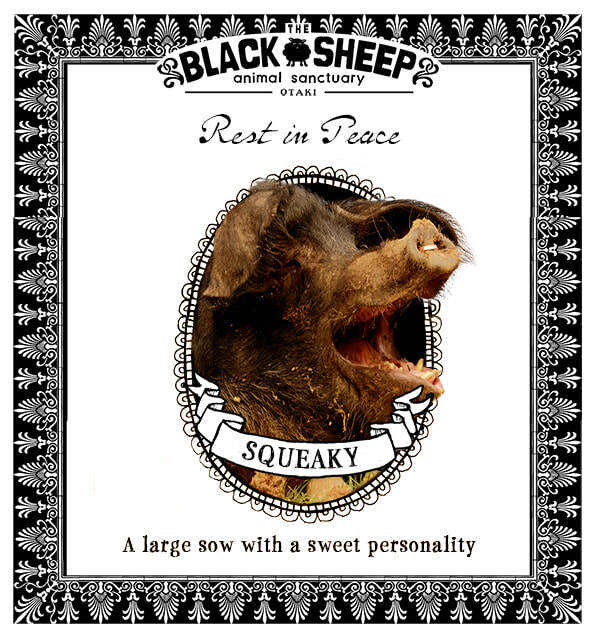 ​Squeaky began her days in a mobile petting zoo. Later she ended up with a pig farmer, who kept her continuously pregnant for two years, until her body was exhausted, and she was likely to be slaughtered. Fortunately she was rescued just in time, and she moved into the Black Sheep, where she is slowly learning to trust humans. 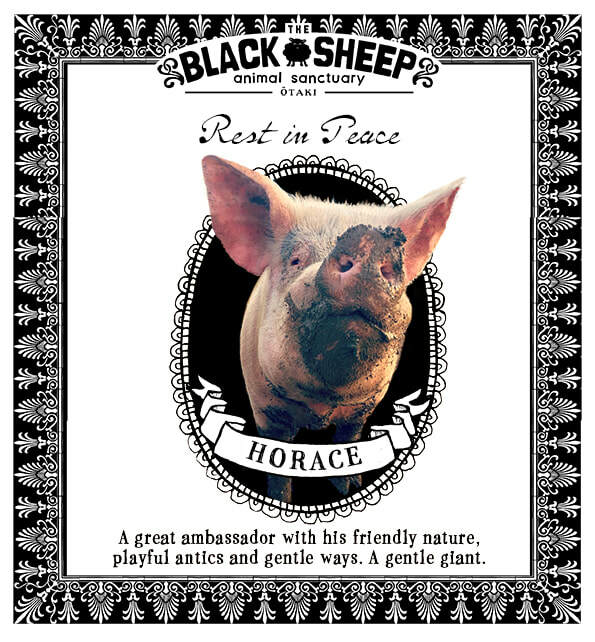 Horace was rescued from a factory farm towards the end of 2011, along with his sister Doris. Horace was a gentle giant, and made himself thoroughly at home at the sanctuary. Doris and Toa will be gutted with his loss, he was a great ambassador with his friendly nature, his playful antics and his gentle ways. He will be greatly missed. 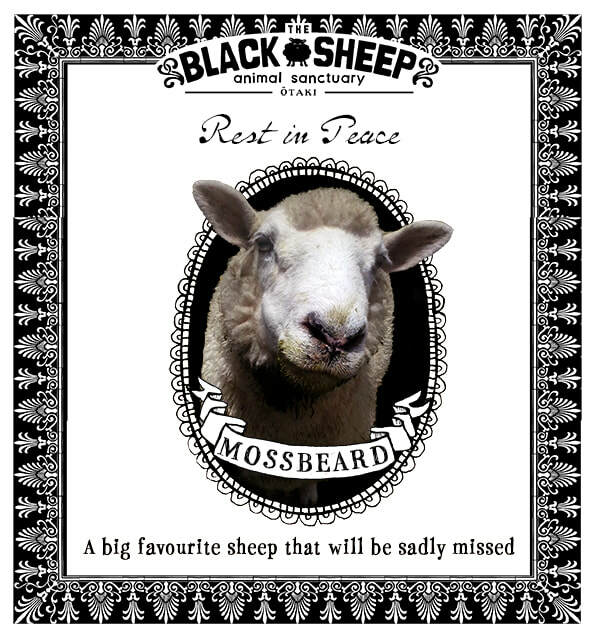 Mossbeard was injured by a seagull as a lamb, but grew up to become a beautiful affectionate sheep who loved people. 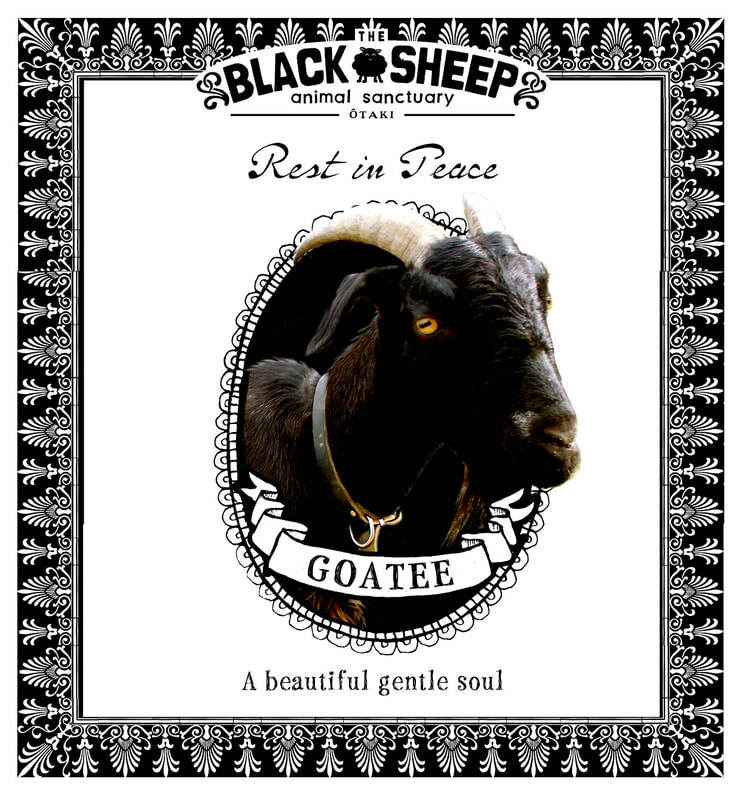 Goatee was a rescue goat who came to the sanctuary from Lindale Farm. He was a beautiful gentle soul who loved people. He knew his name and made many friends among the other goats. 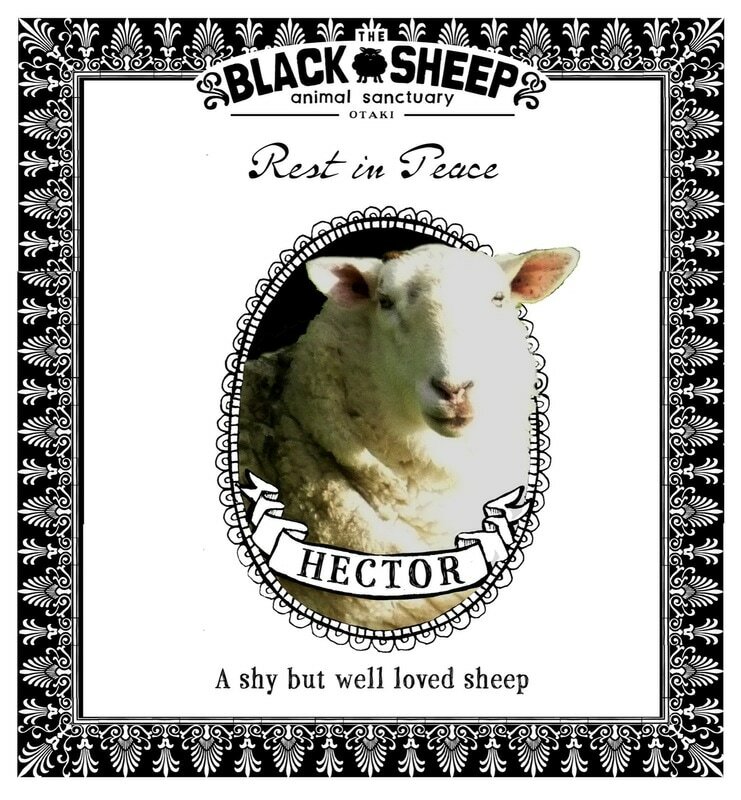 Hector the ram was due to go to the slaughterhouse, along with his friend Ethel, a black-faced sheep. Fortunately a kind person got in touch with us, and Hector and Ethel came and lived with us at the sanctuary. Hector was a splendid boy with a lot of attitude! Hector and Ethel were the first sheep to arrive at the sanctuary. 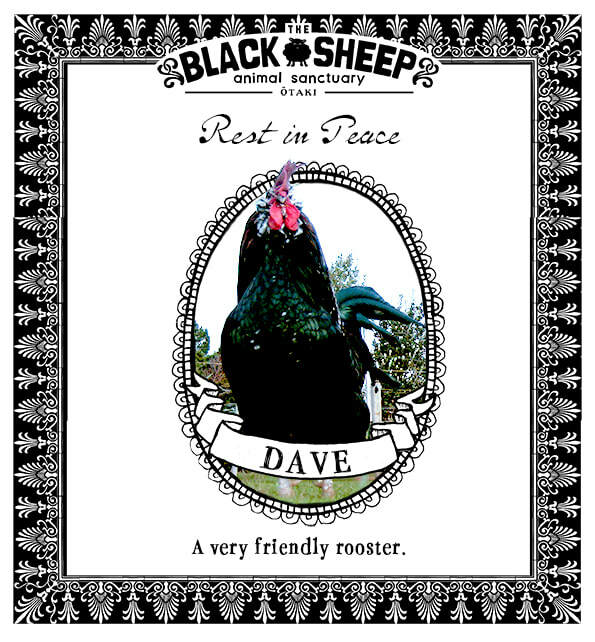 Dave was a very friendly rooster who loved showing off his glorious plumage! Like so many roosters in Aotearoa he was unwanted because he didn't lay eggs and greeted the world each morning in a very loud voice! 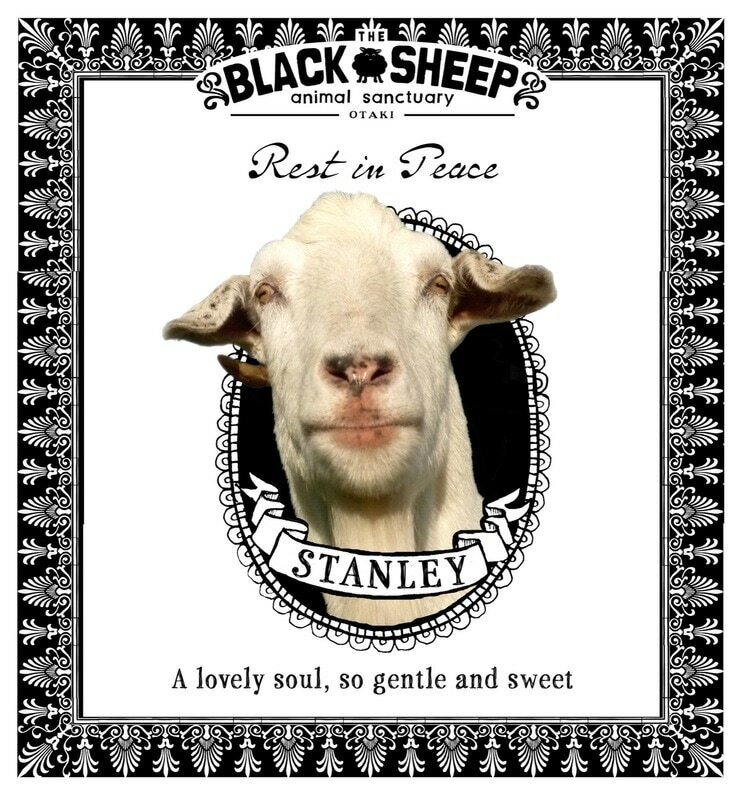 Stanley was a friendly white goat, who arrived at the Black Sheep in 2010 with his friend Hetty. Their caregivers could no longer look after them, and they had nowhere to go. Fortunately the Black Sheep was able to offer the pair a home where they could enjoy life with other goat friends. Stanley loved attention from humans when he was not playing with the other goats. 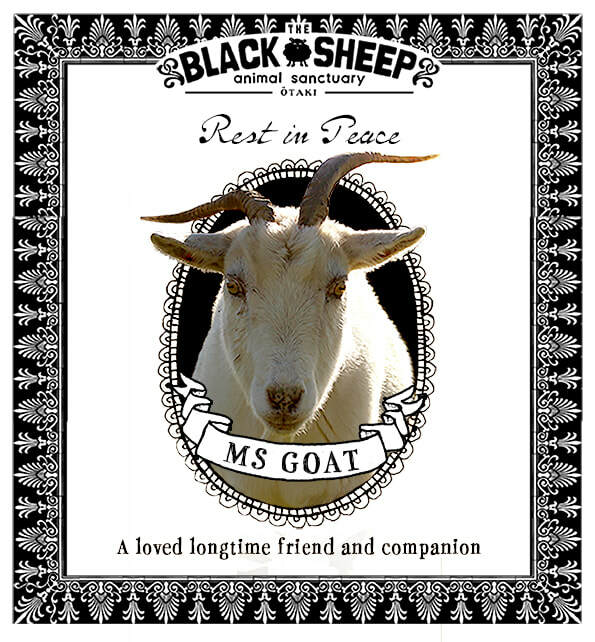 Ms Goat was a loved longtime friend and companion, and is saldy missed by both goats and humans. Originally she had been used as a milking goat. After her caregivers went overseas, she was tethered, and seemed quite unhappy, fortunately we managed to negotiate for her come to the sanctuary, where she was a lovely friendly member of our goat herd. 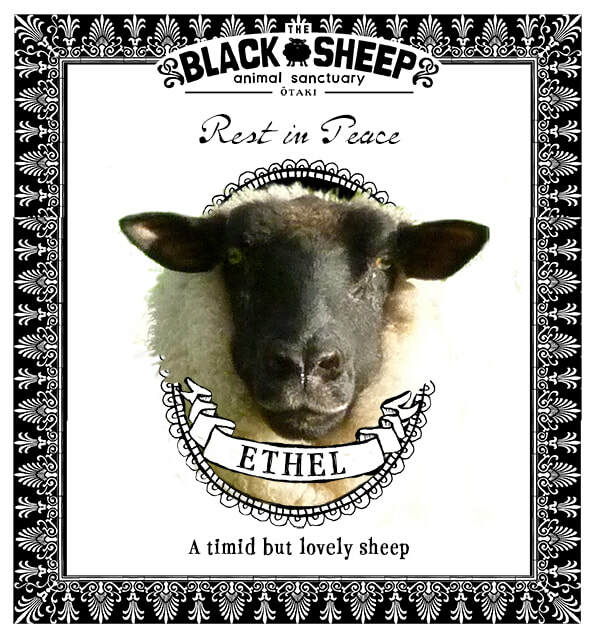 Ethel was a lovely black-faced sheep. She and Hector the ram were due to go to the slaughterhouse, but a kind person got in touch with us, and she and Hector came to live with us at the sanctuary. Ethel and Hector were the first sheep to arrive at the sanctuary. 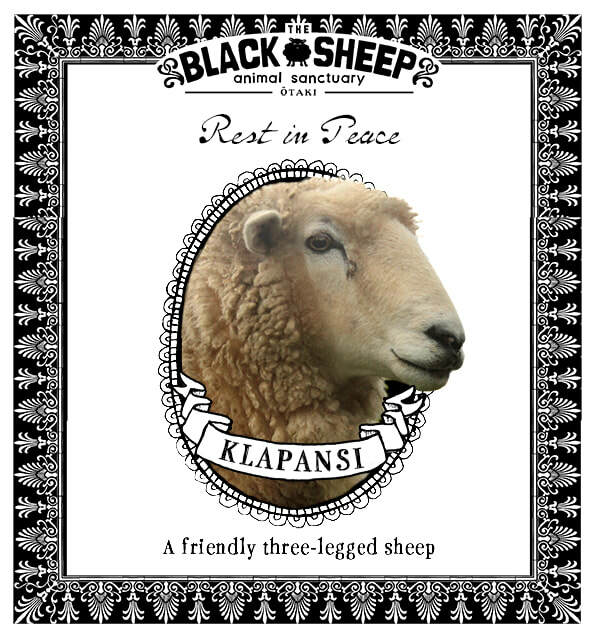 Our lovely Klapansi, with only three legs. The poor boy began his life as a lamb with a deformed leg, which had to be amputated. Fortunately he was able to live contentedly at the sanctuary with the other male sheep. 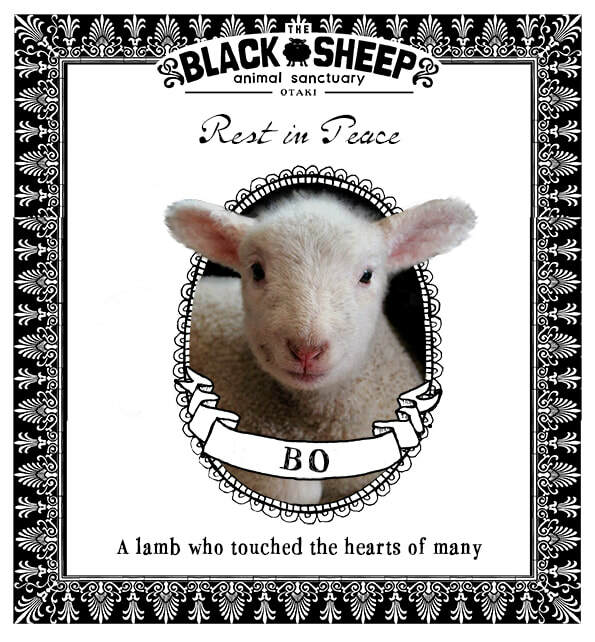 Bo fell through a farm fence as a newborn lamb and was too weak to make her way back through it to her mother's side. A very kind couple rescued her, caring for her lovingly, until she found a home at the Black Sheep Animal Sanctuary – where everyone fell in love with her! 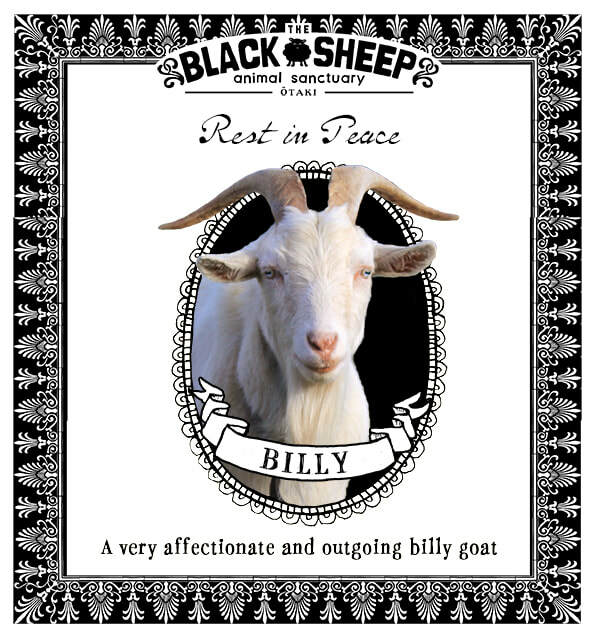 Billy was a very affectionate and outgoing billy goat. He has always been well loved, but his previous caregiver could no longer give him a home, so it was great that we could offer this handsome boy a place. He was extremely gregarious and enjoyed contact with human friends. 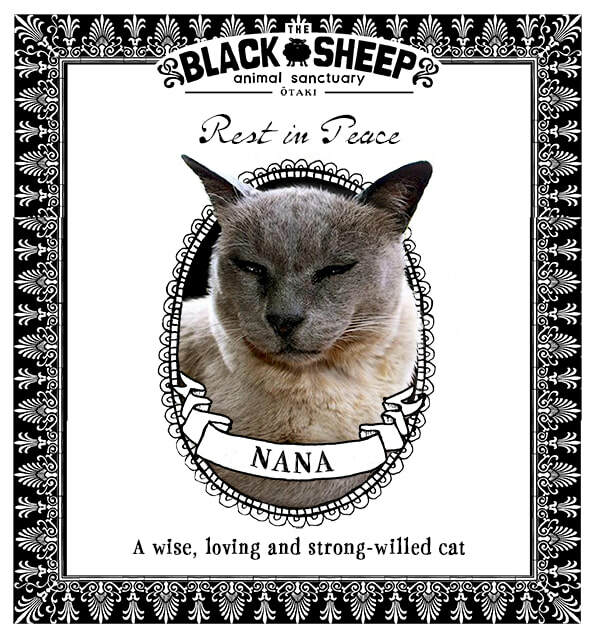 Nana, a rescued Burmese cat who died in her twenties, was one of the oldest sanctuary residents. She was a gentle yet strong-willed personality who charmed everyone she met. Confident, friendly and very interactive, she helped socialise wild kittens, taking them firmly and lovingly under her paw and enabling them to be rehomed. 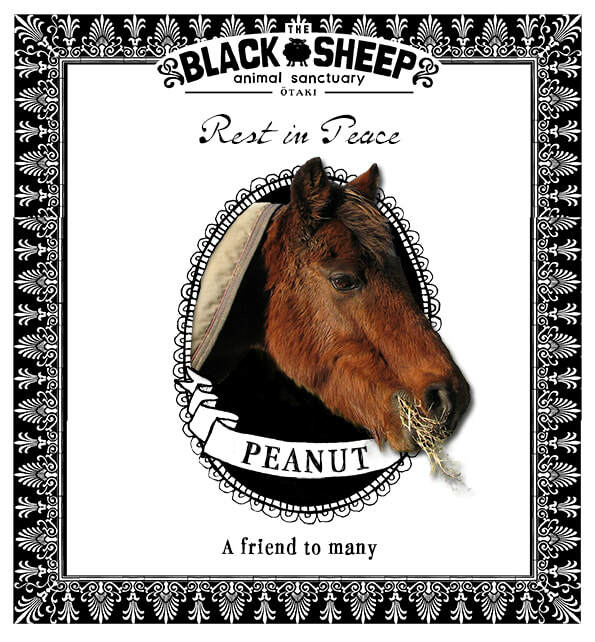 Peanut was a gentle, elderly horse who arrived at the Black Sheep as she needed a safe home for her retirement. She only had a few teeth left, but managed to eat well and enjoy life with her animal and human friends. She liked the company of Thunder the miniature horse, and the sanctuary cows.